Over the years, we’ve helped thousands of customers here at Sun Tint, each with unique personalities, job requests and needs. Still, if there’s one “type” we’ve become expert at spotting, it’s the tinting newbie who’s engaged with a competitor before stopping by our shop. Shoulders rolled forward, shuffling feet, a sheepish smile and a car with purple, peeling windows are all telltale signs of a customer who has been lured in — and severely disappointed — by the sweet Siren song of a competitor’s cheap $99 tint job. It’s a trap anyone but an expert could fall into, which is why many less than savory companies (who may or may not still be in business in a month) set it. These companies give our industry a bad reputation, but it doesn’t have to be that way, just as long as enough customers know what to look for in a good company and eventually drive the bad guys out of business. To help you on your way, here are a few key traits to look out for when deciding whether or not to give a tinting company your business. Tinting is truly a craft, and something only seasoned artisans can do well. Unsavory companies use the the knowledge gap that exists between the customer and the professional as an excuse to create further obfuscation, making customers feel like they have to say yes to whatever they suggest because, well, it sounds right, and hey, what do they know? A reputable company, on the other hand, will be able to answer all of your questions in clear yet comprehensive terms. This should hold true whether or not you’re asking about the application process, the look and feel of the tint, the environmental safety of the tint, or the company’s background. When you leave the shop, you should feel confident you know exactly what they’re going to do to your car, how they’re going to do it, and that your desired outcome is going to be met. If there’s one principle that consistently holds true in the free market, it’s this: businesses that don’t take care of their customers don’t stay open. Period. If you see that a company has been open for many years, that’s a sign that customers love doing business with the company; even better if the company has thrived throughout a family’s ownership. While a new business may be superb (hey, we’ve all got to start somewhere), you should be extremely careful about doing research into the company’s reputation before engaging with them. Look up the owners online to see what other businesses they’ve operated (pro tip: if they’ve had a string of them, that’s not a good sign). Check for customer reviews online, and ask for references. Even if the company is new, there should be at least workers within the crew who have many years of experience to guide the rest of the crew. If not, run. It’s always a great sign when a tinting company’s employees have been around for years. Not only does that mean that employees are well-treated and committed to doing an excellent job, but it also means they’re true craftspeople, dedicated to mastering the art of tinting and keeping up with the latest innovations. This matters, because it means they have the knowledge to provide you with the customized solutions you deserve — rather than, say, attempting to stick a cookie cutter tint onto a window it’s clearly to small for, or forcing a kind of tint on you that doesn’t actually do what you’d like it to. Long term employees aren’t just passing through for the summer, and doing an excellent tinting job for you will be a point of pride. If a tinting company is reputable, they should be able to back their work up with two main warranties. The first is a warranty from the manufacturer, which generally ranges from 5 years to a lifetime, and are often so good that they can be transferred to a new owner. You’ll know you’re getting a high quality film like this when your film is backed by a Lifetime, Nationwide, Manufacturers’ warranty that covers any kind of bubbling, peeling, cracking, and distortion. The best films will have warranties that even cover fading and color fastness. Of course, the shop should provide you with clear written documentation of this warranty, and should also provide a second lifetime warranty guaranteeing their own labor and installation. When a company doesn’t offer warranties like this, it often means they’re not actually applying the brand or quality of tint that they say they are. In fact, we recently researched a competitor one of our customers visited before they found us by contacting the manufacturer of the tint that company claimed to have applied, and no one at the manufacturer had ever heard of our competitor. They had outright lied to our customer, charging more for cheap tint, and the customer was the one to suffer. That’s an outrage, and not something that should ever happen. $99 tint jobs (aka: $129 tint jobs, $99 tint & alarm specials) are THE biggest scams we encounter in our industry. The truth of the matter is that an excellent tint job — one that uses the highest quality, most effective tint and is expertly applied — simply cannot be done for $99. There’s a reason, after all, that $99 tint jobs don’t come with warranties: they’ll be peeling in less than a year. And, more than likely, they won’t actually do a good job of keeping out the sun’s most damaging rays, and will look terrible too. (We call it Purple Window Syndrome). While you’ll pay less upfront, you’ll pay more in the long run to fix the damage. Even more disturbing: some tinting companies that advertise $99 tint jobs will be honest about the lackluster results that tint will get you, and then will immediately try to upsell you better tint. How can you possibly trust a company that gets you in the door under false pretenses? You should never leave a shop feeling stunned and having parted with far more money than you ever expected to spend. Tinting your car windows is a great way to protect both you and your car, but only if you do it right the first time. Don’t settle for a sleazy tinter who can’t guarantee their work. Look for a tinting expert who builds trust and honesty from the start. 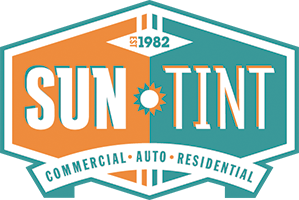 When you’re ready for a tinter who knows their business, contact us at Sun Tint for a free consultation. We especially welcome you if you’ve gone to a competitor first. In fact, we’re waiting with an empathetic ear, a big hug, and Sammy, our golden retriever PR man, who just wants to give you some love! I really like your suggestion to find a tinting company that has been around for a long time. My mom has been wanting to have the windows tinted on her car and has been looking for a good company to apply the tint. It is good to know what to look for in a good reputable company. Thanks for the tips! My home has a lot of windows, so the best option that I have to get the privacy that I want seems to be installing thicker curtains and leaving them shut at all times. I don’t really want to do that, so adding window tinting seems like a good way to get the privacy that I want without leaving my shutters and curtains closed. Hiring a service that has a good reputation and has years of experience in the community seems like a really great tip for finding a good window tinting service. I would want to know that the company I hire is trusted by my friends and neighbors, so I’ll keep that in mind while looking up different companies. Really appreciate your efforts! It is very important that one finds out how long they have been in the business. How many happy customers they have and whether they adhere to quality standards. These are aspects customers should consider before getting tints installed.